This Month’s imaging object is a rather beautiful globular cluster in the constellation Sagitta – M71. The nice bright star towards the top left in the image below is Gamma Sagitta, and M71 lies mid way between Gamma and Delta Sagitta. 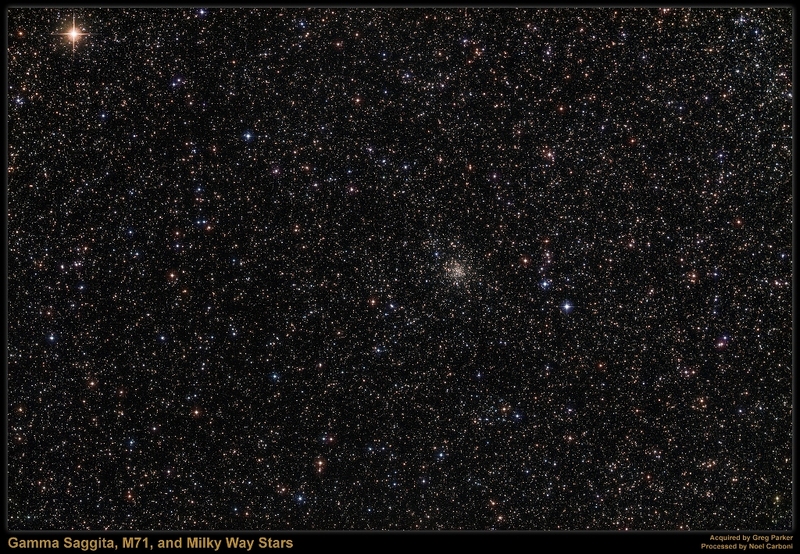 M71 looks rather loose for a globular cluster and there was controversy over whether this object was in fact an open cluster – it seems without doubt that this is a globular cluster lying around 13,000 light years away in the constellation Sagitta. I see from my notes that I did not start imaging this one until around 11:30 p.m. so we still have the problem of the late nights and early mornings of Summer 🙁 However, being a cluster we can keep the subs down to a reasonable 2 or 3 minutes each using either the f#2 Hyperstar or the f#4.5 Sky 90 which means that we don’t need to continue imaging until the Sun comes up, but we can get away with just a couple of hours or so of good data. It is still a very difficult month for imaging with the very late starts, but after no imaging at all during the whole of June it’s now worth getting out to try and grab hold of ANYTHING. I am now longing for the shorter evenings which start to make their appearance beyond mid-August. Does anyone else notice a regular variation in intensity in the image, both in X and Y? Like a regular patchiness? Is it real (! ), or is it my eyesight, or an artefact of imaging or processing? Re my previous comment – the image looks entirely different if I right click on it & go “view image”. hence, some sort of aliasing with my monitor resolution & how it’s presented on the web? I don’t see anything odd using both your methods to look at the image – guess it’s something to do with your settings. You can always go into the image gallery and see what things look like there. Hi Pete, you may have noticed some artefacts in some images (I don’t notice any in this image but I’m not an expert). The images presented on the website are resampled and compressed to try and ensure that most people get a faster download. The images that Greg and Noel produce at full resolution are over 1MB in size – most people would be frustrated with downloading this size so we try to keep them at 500KB or less. Hope this helps. Always a good but faint on for the summer,M71,managed to see it from just outside Brodick,Isle of Aran,Scotland,in Oct.last year with 8×20 binocs.not sure if u can see if from around Oxford due to light pollution,will have alook when it its higher,will try with my 8×30 monocular.